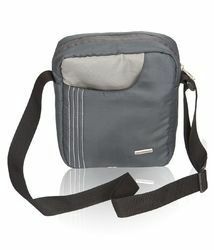 With our in-depth industry experience, we are offering our clients with an attractive range of Ladies Trendy Side Bag. - Company Name:Indarsen Shamlal Pvt. Ltd. I love this bag. Angelina is vibrant and a great size - approximately 15" high, 22" long at the top and 11" wide at the bottom. She is made with quality wax print fabric from Ghana, West Africa. We are offering Ladies Side Bag to our clients. Dimension (Inches): 6" x 11" x 10"
Side Leather Bag for office in real goat leather.